The Church from Age to Age presents an accessible, engaging, and comprehensive survey of ecclesial and theological history. The volume stands out for its detailed discussion of both European developments and the manifold expressions in the global South. Significant themes, personalities, and events are examined historically and chronologically through multiple lenses: confessional and critical approaches, and past and contemporary concerns (continuities and discontinuities), alongside ecclesiastical, political, historical, social, theological, biographical, and primarysource analyses. With these approaches, the authors show “the tug and pull of inclusiveness and exclusiveness” in church history. Though written primarily by Protestant historians and missiologists, the authors even handedly treat other traditions (Christian, or otherwise, including developments in the modern secular world). Other remarkable features of the book include a twenty-eight-page timeline, maps, and bibliographical sources, and additional listing of popes, church councils, eastern patriarchs of Constantinople, and the World Council of Churches assemblies. A chapter of excerpts, “readings from primary sources,” concludes each of the seven chronological sections of the book. The volume will soon replace existing abridged Christian histories and dogmatic introductions for pastors, seminarians, and interested lay readers from across confessional Protestantism. 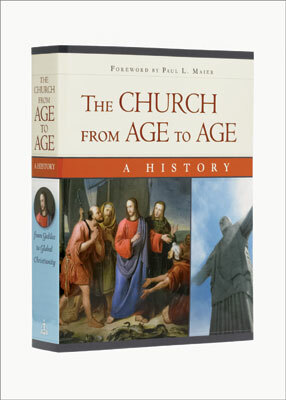 The Church from Age to Age is also available for Kindle.